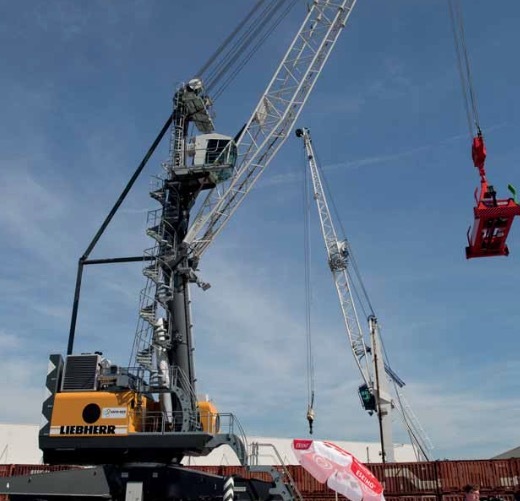 HAFEN WIEN INVESTED IN A NEW LIEBHERR MOBILE HARBOUR CRANE,TYPE LHM 280,WHICH STARTED OPERATION IN AUGUST 2015. Hafen Wien operates the largest free port in Austria. Its perfect connection to waterways, road and rail network characterize this port in the Austrian capital of Vienna. The port is continuously expanding to become one of the largest and most modern logistics centres on the Danube in Europe. In order to update its facilities, the company opted for a Liebherr mobile harbour crane, type LHM 280. Providing a maximum lifting capacity of 84 tonnes and an outreach of up to 40 metres, the crane is equipped with two winches for highly efficient cargo handling. “Our new mobile harbour crane helps us to improve cargo handling efficiency. Thanks to its versatility and mobility, we are able to expand our service portfolio which is important for the future development of our port. This investment also strengthens the attractiveness of inland waterborne transport,” says Karin Zipperer,Technical Director of the port. Hafen Wien has already successfully operated a Liebherr mobile harbour crane, type LHM 1080 (Grey crane in the background of the picture on the left), for more than 25 years. The new machine, which started operation in August 2015, is twice as strong as the old one and universally applicable.Although the LHM 280 is 55 metres high and 240 tonnes heavy, the crane is mobile and highly flexible. The new cargo handling solution will be used for container handling, bulk handling as well as general cargo operation. Taking a major step towards low-emission but high-performance, the LHM 280 is equipped with Liebherr’s unique Pactronic® hybrid drive system. Pactronic® is regenerating the reverse power while lowering the load. In addition, the surplus power of the primary energy source is also used for charging the accumulator. The stored energy is transferred back to the system when the crane requires peak power during hoisting. In terms of turnover capacity, that means a plus of 30% compared with a conventional machine with equal power rating of the primary energy source. In addition, Pactronic® leads to a reduction of fuel/energy consumption (litre/tonne) as well as CO2 and exhaust emissions in the range of 30% depending on the operation. Hafen Wien also ordered Liebherr’s Cycoptronic® system for its new LHM 280.This optional tool ensures accurate and sway- free load motion through initiating dynamic counterbalancing movements for operation at maximum speed. The Cycoptronic® teach-in feature is a point-to-point control for semiautomatic operation. It pilots the crane to predetermined loading and unloading points at the highest possible speed. The Port of Vienna is conveniently situated at three TEN-T corridors and is one of the main hinterland hubs in Europe, especially for the major North Sea ports and the Adriatic ports. With its facilities in Freudenau, Albern and Lobau, Hafen Wien is the largest public port on the Danube in Austria, handling 13 million tonnes of cargo per year. The new investment in the Liebherr LHM 280 will further strengthen its market position. The new P-X series of industrial gear units combines the advantages of SEW-EURODRIVE’s P planetary gear units with those of its helical-bevel gear units in the X range. With specially designed housings that integrate the intermediate flange, the result is a series of compact, weight-optimized drive units. These are available in seven sizes and with a torque range of 100 to 500kNm. to shredders, sugar mills and wood panel systems, SEW-EURODRIVE’s P-X industrial gear units provide the ideal drive solution for a wide range of high-power, high-performance applications. With seven sizes to choose from, torques of between 100 and 500kNm, and a gear ratio range of i = 160 to 560, they also offer a great deal of flexibility. One key feature comes in the form of the high thermal ratings that these industrial gear units are equipped for as a result of their shared oil chambers and thermally optimized housings — this helps keep down cooling system costs. However, the drive units also function reliably at temperatures of below –25°C if used in conjunction with the relevant heaters and heating mats. Another important plus-point is that the housings are designed as symmetrical, invertible enclosures and have an inspection cover on both sides.What’s more, the motor adapters can be used to connect motors of up to IEC 355 with 500kW. the received is fully tried and tested, as the P-X series combines the best of two well-established industrial gear unit worlds and thus represents many years of experience with numerous drive units in the field. Anyone with only a superfluous familiarity with fluid technology could easily underestimate the performance and intelligence of modern hydraulics, writes Dr. Steffen Haack, Executive Board of Bosch Rexroth AG, responsible for Industrial Applications and Sales Division. Need-based energy efficiency: software combines the best from electrical and hydraulic systems. The decentralized intelligence in the electronic control device adjusts the rotational speed of the pump drive on demand as the consumer requires power, or it lowers it to zero. In comparison to common constant drives, this reduces the energy consumption of hydraulic power units by up to 80%. By the way: even older facilities and machines can be retrofit without major efforts to significantly reduce the energy consumption in production. Balanced drive physics: fluid technology is not always inherently linear. Drive software for hydraulic actuators takes these particularities into consideration and harmonizes them automatically. Preprogrammed, typical hydraulic functions, e.g. synchronization or position-dependent braking, merely require the optimization of parameters within the scope of start-up. They are based on a transparent software structure and function equally on all hardware platforms. Open and outgoing: with increasing frequency, real time Ethernet protocols in modern machines integrate all actuators and peripherals into each other. Modern motion controls for hydraulic drives support all common protocols, e.g. Sercos, EtherCAT, Ethernet IP, PROFINET RT, Powerlink and Varan. Their software is also based on open standards, e.g. IEC 61131-3 and PLCopen.With this they are an ideal match for the increasingly integrated and technology-overlapping infrastructure of modern production environments — all the way up to Industry 4.0. Those who need prototypes or special plain bearings in the future will be able to get even faster solutions supplied by igus. A year ago at the Hannover Messe, the expert for motion plastics and high-performance plastics for moving applications, presented the world’s first tribo-filament for 3D printers. Now igus has expanded its range of offers and will now provide a 3D printing service to its customers by delivering special parts even faster and at very affordable prices. over the complete production of special parts. “Our customers can contact us with their 3D data and get their parts quickly and easily printed by us,” says Tom Krause, product manager at igus iglidur® tribo- filament. “This is what we have been occasionally carrying out in recent months and now want to offer this service to all our customers.” igus has expanded its potential with the tribo-filament, which is 50 times more abrasion-resistant than conventional 3D printing materials and delivers even more unusual geometries quickly and easily. The delivery times for printed parts are mainly dependent on the complexity of the components. ‘From 24 hours’ is a statement that is also true for these igus products. prices are also determined automatically online, and similar to the indication of the delivery time, the price also depends on the complexity and the structure of the component. “It is also possible for us to print components from two different plastics,” says Krause. “That means it can print either very complicated components in which the support material dissolves, or the component is printed from a normal ABS and only the sliding surfaces are made of our abrasion-resistant iglidur I180-PF.” At the Hannover Messe, igus offers, as a first step, components such as worm gears from this first low wear tribo-material. In the future, complex shapes can be printed from more iglidur® standard materials to offer users more creative freedom in their designs. From the Hannover Messe onwards, igus will offer a 3D printing service with the in-house tribo-filament and will take over the complete production of special parts. “Our customers can contact us with their 3D data and get their parts quickly and easily printed by us,” says Tom Krause, product manager at igus iglidur® tribo- filament. “This is what we have been occasionally carrying out in recent months and now want to offer this service to all our customers.” igus has expanded its potential with the tribo-filament, which is 50 times more abrasion-resistant than conventional 3D printing materials and delivers even more unusual geometries quickly and easily. The delivery times for printed parts are mainly dependent on the complexity of the components. ‘From 24 hours’ is a statement that is also true for these igus products. The service for customers is made as simple as possible up to the finished component. The data can be uploaded on the igus website and the components ordered. The prices are also determined automatically online, and similar to the indication of the delivery time, the price also depends on the complexity and the structure of the component. “It is also possible for us to print components from two different plastics,” says Krause. “That means it can print either very complicated components in which the support material dissolves, or the component is printed from a normal ABS and only the sliding surfaces are made of our abrasion-resistant iglidur I180-PF.” At the Hannover Messe, igus offers, as a first step, components such as worm gears from this first low wear tribo-material. In the future, complex shapes can be printed from more iglidur® standard materials to offer users more creative freedom in their designs. A BLUETOOTH INTERFACE AND ANDROID APP HAVE BEEN DEVELOPED BY SENSOR TECHNOLOGY LTD FOR ITS NON- CONTACT TORQUE SENSOR,THE TORQSENSE. TorqSense is unusual in that it does not have to be physically connected to the shaft the torque level of which is being measured. Instead two tiny piezoelectric combs are glued onto the shaft and an adjacent radio transmitter/pickup monitors their distortion due to the shaft’s rotation, using radio frequency waves. There is no physical connection between shaft and sensor, hence no need for delicate wiring or fiddly slip rings. Having a Bluetooth enabled TorqSense transducer removes the need for cable runs from the sensing head to the receiver.This can make system lay out easier and even allow torque to be measured in real time in situation where it was previously impossible.